Opera | A High-Tech Blech! I have been having trouble signing into flickr for a long time now. As a matter of fact, I mostly stopped using flickr because of this issue. My initial tests pointed to a third-party cookie issue. It seemed that either flickr was requiring them or Opera was misinterpreting non-third-party cookies as though they were third-party cookies. A recent test has shown this to be incorrect. The problem does relate to the cookies but in the end you will be able to sign into flickr with third-party cookies globally disabled using Opera. Here is my workaround. It is very simple. Clicking on the login link or returning to flickr’s home page and clicking the login link or just going to the login page directly will all take you into this silly loop from which you will not be able to extract yourself. If you are seeing this page, your browser settings prevent you from automatically redirecting to a new URL. You have successfully worked around the issue. Congratulations. Some of the most interesting features and ones which I constantly take advantage of I will mention briefly here. Opera allows you to sync your bookmarks between any number of computers (across platforms) and with Web access instantly through their Opera Link feature. This sync tool also syncronizes a number of other browser features as well. Opera has a flexible and powerful built-in notes feature (which can be synqued). You can copy portions of Web pages directly into a note and mail your notes later. The layout and look of Opera are completely manipulable. My arrangement of panels, toolbars, and buttons have little resemblance to what came out of the box. I don’t use skins usually, but if you are into that sort of thing Opera makes it very easy. Through this you can make the browser look and perform in ways that are most comfortable to you and the way that you work. Opera employs mouse gestures. When I tell folks about mouse gestures they are often rather cool to the idea. Until they try them. Once they understand how mouse gestures work, they have no desire to turn away from them. Mouse gestures are so infectious you will yearn for your file browsers and other applications to use them. It’s ad-blocking, image blocking, and site-specific preferences are unparalleled—and they are all available by a simple right-click on a Web page. And Opera can do all of this out of the box with a smaller memory footprint than its competitors. It also wins test after test in the browser wars. Lifehacker loves Opera. There are many others but I wanted to give out some of my favorites. Make the switch now. You won’t regret it. One of the nice bits about running a version of Linux which supports a robust package management system is that the operating system itself can manage your updates. This means that not only does your operating system seek out and alert you to updates for itself, but it can also alert you to newly available versions of your favorite software—and then, at your command, run that update. You’ll want to have a terminal open for a couple of lines of code. You can open a terminal by navigating to Applications —> Accessories —> Terminal. 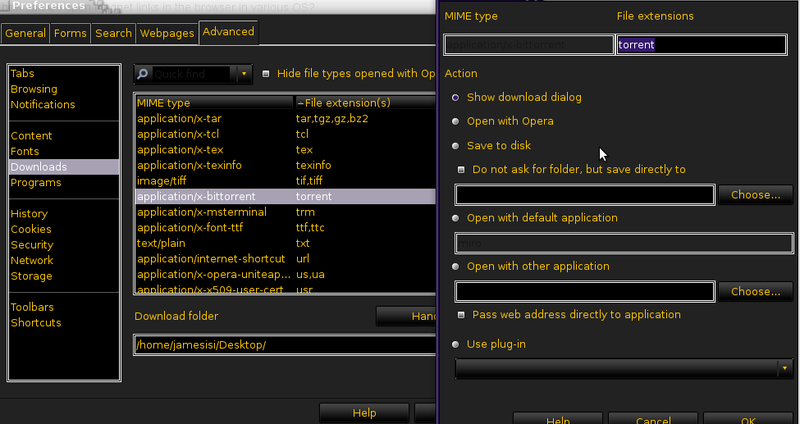 There are only two (one if you already have Opera installed) and you can just copy and paste them into the terminal window. Ok, let’s ask Synaptic to manage any new updates that come down for Opera. Open Synaptic (System —> Administration —> Synaptic Package Manager). You will be asked for your password. You’ll need to add the public key. Go back to Synaptic and navigate to Settings —> Repositories —> Authentication and click the “Import Key File…” button. Find the file you just saved with the key in it and click “OK” to import the key and then the “Close” button which follows. Now, when you click the “Reload” button in the Synaptic Package Manger you will not get a key verification error. From now on, when you run your updates by navigating to System —> Administration —> Update Manager it should seek out any new updates for Opera in addition to any updates otherwise ready for your system. Thanks to my friends over at MyOpera who helped to make this happen. Of course, thanks to all those Debian contributors for doing all the heavy lifting. The key changes annually and so you will need to revisit the above page to get the new key each year.